ESE Direct > Articles > Whose brand is it anyway? As we are currently celebrating our 40th year in business we thought it would be interesting to take a look at some of our favourite brands. It's surprising just how old and long established some of them are! We've included those local to us here in Norwich and National brands too. 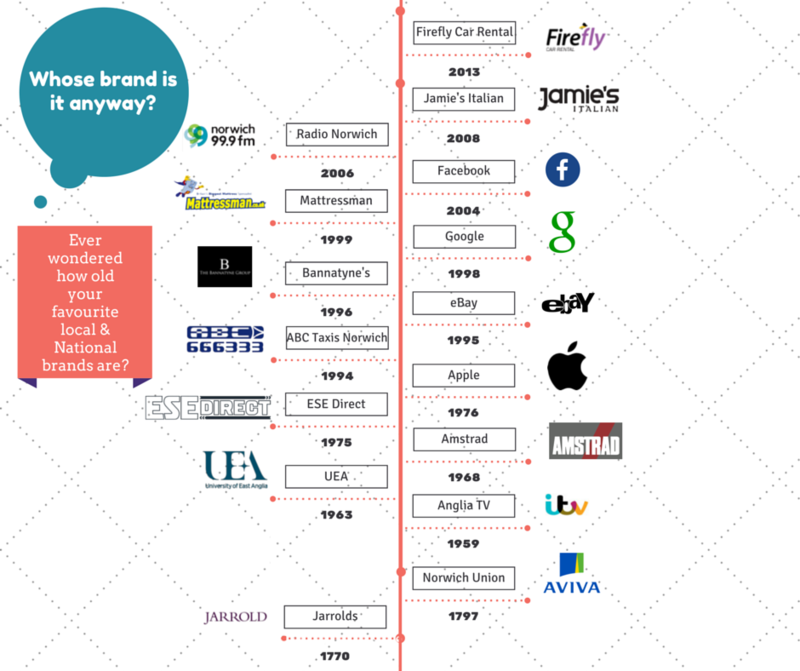 We've put together this infographic which shows some popular brands going all the way back to the 18th century. Jamie’s Italian – Proper pukka restaurants. Jamie Oliver opened his Norwich branch in July 2012. A fine restaurant in the fine city. Radio Norwich – Many will think Alan Partridge when they hear Radio Norwich – but to those not from Norfolk - Radio Norwich is an actual radio station based in Thorpe in Norwich, you can hear it on the airwaves at 99.9 FM. Facebook– Originally set up by some roomies at Harvard University, Facebook has become part of the furniture for celebrities and non-celebrities alike. In 2014, Shakira became the first celebrity to collect over 100 million likes. That’s a lot of likes, Like. Bannatyne’s – Entrepreneur Duncan Bannatyne actually left school at 15 with no qualifications. eBay – would you buy a broken laser pointer? Somebody did. It was the first thing sold on eBay back in 1995. ABC Taxis – In 2013 ABC included environmentally-friendly cars in their fleet. We like this. ESE Direct – Established by Brian Francis, ESE originally operated from a small summerhouse in his back garden. Amstrad – The name Amstrad stands for Alan Mark Sugar Trading. Its founder, Lord Sugar, set up this company when he was just 21 years old - a mere whipper-snapper! Anglia TV – Who remembers Sale of the Century, Trisha, Knightmare and The Chief? Some of the most popular television series from ITV Anglia as it is currently known. UEA – Some graduates of the University of East Anglia include Matt Smith aka Doctor Who, Newsreader Selina Scott and Radio 1 DJ Greg James. Norwich Union – In 2000 Norwich Union merged with CGNU. In 2002 it began its rebranding and became Aviva, at an estimated cost of £80 million. Jarrolds – originally established in Woodbridge, Suffolk, Jarrolds now provides the prettiest Christmas lights in Norwich. (In our humble opinion).